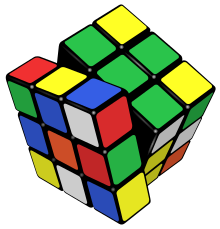 Rubik's Cube is a 3-D combination puzzle inventit in 1974 bi Hungarian sculptor an professor o airchitectur Ernő Rubik. ↑ William Fotheringham (2007). Fotheringham's Sporting Pastimes. Anova Books. p. 50. ISBN 1-86105-953-1. ↑ de Castella, Tom. "The people who are still addicted to the Rubik's Cube". BBC News Magazine. bbc.com. Retrieved 28 April 2014. This page wis last eeditit on 8 Mairch 2015, at 23:12.